Brasserie Beck is a contemporary European style brasserie in the heart of DC's burgeoning McPherson Square neighborhood. 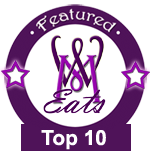 Serving French/Belgian cuisine, Chef/Owner Robert Wiedmaier of Marcel's opened this casual, contemporary brasserie named after his younger son in Spring 2007. Beck is an ideal place for a meal anytime of day - from oysters at the raw bar to hearty veal osso bucco. Also enjoy their comprehensive beer list featuring nine beers on draught and over 100 by the bottle. Closest Metro is McPherson Square. The stunning space features an open steel and glass kitchen visible from three sides, set across from a unique family-style chef's table, dramatic 22-foot ceilings and a raw bar located at the end of a grand marble and walnut bar featuring an array of Belgian beers on tap. An expansive outdoor patio is open April through October. 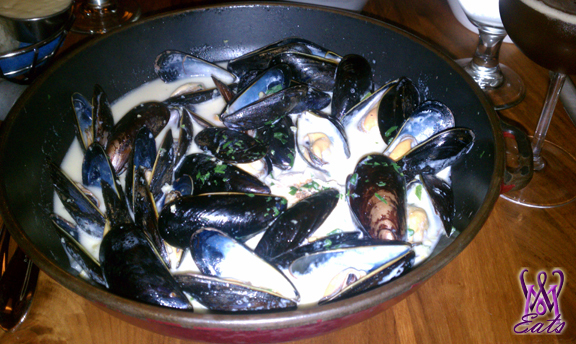 Keith and I had just finished watching a movie at E Street Landmark Theaters, and were in the mood for some mussels. We walked uptown a few blocks to Brasserie Beck. We did not have reservations yet arrived fairly early, so the dining room was empty and we were escorted to a cozy table by the window. The staff was super friendly with each person welcoming us with warm greetings as we walked by. That was a lovely touch to start off the evening. 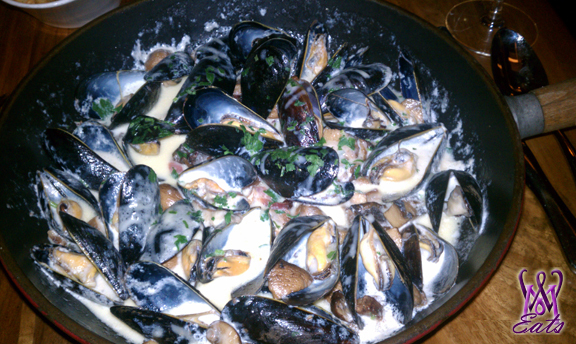 Our server recited the specials of the evening - all of which sounded divine, but since we had our heart set on mussels we passed on either of them. The grilled octopus appetizer really piqued my interest though and I would love to come back again and try it. Then, our server mentioned that for the whole month of January, they are featuring a special "dinner for two" from 5-6:30pm only. Two full portions of mussels (your choice), with fries, and a 750 mL bottle of Mont St-Aubert 2009 vintage Belgian Reserve ale - all for $50. This was perfect - just what we wanted! Several minutes later, our server returned with the beer which he presented and poured like wine. He even stated he would "keep the bottle chilled on ice" for us. All of this added to the high points for service. The beer itself was dark with a mild fruity flavor. I typically do not care for this type of beer, but found it to pair perfectly with the mussels. Must be a flexible beer too, since Beck's mussels come in a variety of flavors ranging from traditional garlic, to earthy mushroom, to spicy red curry style. Our main meal arrived fairly quickly in large pans. I was impressed with the portion size and Keith was pleased that we each received a full portion of fries, instead of one to share. I took my time enjoying each morsel and saving much of my broth to be sopped up with the bread that we saved. 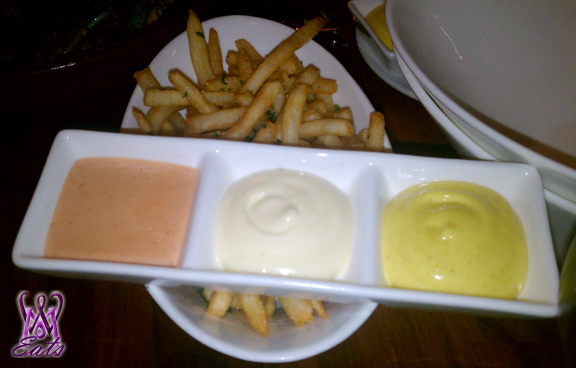 Our only minor complaint was that the fries were over salted - however, I appreciated the trio of aioli sauces that came with it. Other places typically charge extra for flavored mayos. Keith prefers the fries at Granville Moore's or Belga Cafe over Beck's, but we both found the mussels themselves to be very comparable. I love the classic version I ordered but thought Keith's mushroom version to be much more decadent and even to have a bit more mussels than mine. All in all, I really enjoyed my meal here and was happy that we came early enough to be seated in a nearly empty room. But by the time we left, many diners had already arrived to start their evening. Many of the regular entree items seemed rustic and I would recommend Brasserie Beck to those looking for a hearty meal in an upscale casual setting.